Larkin, Irfôna et al. "Concert Halls and Opera Houses". The Canadian Encyclopedia, 20 January 2014, Historica Canada. https://www.thecanadianencyclopedia.ca/en/article/concert-halls-and-opera-houses-emc. Accessed 21 April 2019. Perhaps the oldest references to a venue for musical performance are the ones found in the Quebec Gazette of 29 Nov and 24 Dec 1764 which advertise dances to be held at the Concert Hall. However, the building, or at least the name, did not last very long, and concert performances in Quebec City in the last two decades of the 18th century took place at such a variety of places as the Thespian Theatre, Marchant's Coffee House, Frank's Tavern (Taverne de Frank), Ferguson's Hotel (Hôtel de Ferguson), and the Nouvelle Salle des Spectacles. The Théâtre Patagon was the scene of the first Quebec City performance (1805) of Quesnel'sColas et Colinette. The names of places where Montreal concerts were held suggest similar makeshift arrangements: Mr Cushing's long room, Mr Frank's Assembly Room, Dillon's Hotel, and the Salle de Spectacle. The Theatre Royal and the Masonic Hall were centres of public entertainment in early-19th-century Montreal. There was a Halifax Theatre in the 1790s, and from the end of the century until at least Confederation that city boasted a Theatre Royal. St John's, Nfld, had its Amateur Theatre and Globe Tavern. No doubt some of these halls were little more than wooden sheds, and fire was a great danger - eg, the blaze that destroyed the Théâtre Saint-Louis of Quebec City during a performance in 1846 and that which razed Montreal's Masonic Hall during a song recital in 1833. The growth of population and of wealth in the second half of the 19th century led to auditoriums of more solid construction and, usually, a good measure of elegance (eg, Toronto's St Lawrence Hall, 1850, restored to its erstwhile splendour and original function in 1967); and though by modern standards these were recital halls rather than symphony orchestra halls, some were of considerable size. The most frequent name for such halls was Academy of Music. One of these, built in Quebec City in 1852 by Charles Baillargé, one of the architects of the original Parliament Buildings in Ottawa, was counted among the most beautiful halls in North America. It burned down in 1900. The name also was used in Ottawa, Sorel, Que, Toronto, Montreal, and Halifax (see Academy of Music for details on those in Montreal and Quebec City). Following the model of London, both Toronto and Montreal erected Crystal Palaces, in 1858 and 1860 respectively. St Patrick's Hall (1867) in Montreal and Shaftesbury Hall (1872) in Toronto frequently resounded to music. These halls, and many similar ones in other cities, were used not only for music but also for political rallies, balls, plays, lectures, minstrel shows, vaudeville, and, on occasion, even operetta and opera. Tara Hall in Quebec City, originally used for non-musical purposes, began to be used regularly as a concert hall around the turn of the century. It was eventually surpassed by other halls and was destroyed in 1918, most likely by fire. Although opera was rare (see Opera performance), the name stood for the ultimate in elegant entertainment, and many opera houses in which opera would never be heard were erected. The name thus was a deliberate euphemism. 'Opera houses' were opened in Ottawa (by 1874), Toronto (1874), Montreal (1875), Kingston (1879), Winnipeg (1883), and Vancouver (1891). Indeed the name was attached to new theatre buildings even in smaller towns, from Nelson, BC (600 seats), to Yarmouth, NS (850 seats), including such remote places as Dawson City, Yukon; Canmore, Alta; and Indian Head, Sask. The 43 Canadian 'opera houses' listed in Julius Cahn's Official Theatrical Guide 1905-1906 include those in Nanaimo, BC; Portage-la-Prairie, Man; Arnprior, Gananoque, Mount Forest, and Petrolia, Ont; and Charlottetown, PEI. (The book does not list any Quebec province opera houses.) 'Grand' opera houses existed in many Ontario cities and towns: Barrie, Brockville, Chatham, Collingwood, Hamilton, Kingston, London, Ottawa, Port Hope, St Catharines, and Toronto (where Albani made her Canadian operatic debut 13 Feb 1883), while St Thomas had a 'Grand' as well as Dunscombe's New Opera House. The largest ones listed by Cahn - Kingston, London, Stratford, and Toronto - had between 1500 and 1900 seats. While most of these late-19th-century opera houses and music halls have been demolished, destroyed by fire, or converted to movie houses (with appropriate name changes), the occasional one has been restored to its old magnificence and given back its name of 'opera house,' eg, the one at Barkerville, BC, in 1958. In Cobourg, Ont, Victoria Hall (Cobourg, Ont), with its 300-seat auditorium, had its 1860 elegance returned to it by 1980, and in Petrolia, Ont, another of Canada's several Victoria Hall (Petrolia, Ont)s was restored during the 1970s. Two which have retained their names throughout the decades are the Gravenhurst (Ont) Opera House - its style suggests 1915 - and the Haskell Opera House. In Orillia, Ont the 700-seat Opera House, built in 1895, burned and rebuilt in 1916, was used as a movie house into the 1970s, but in the early 1990s was undergoing restoration as a performing space. 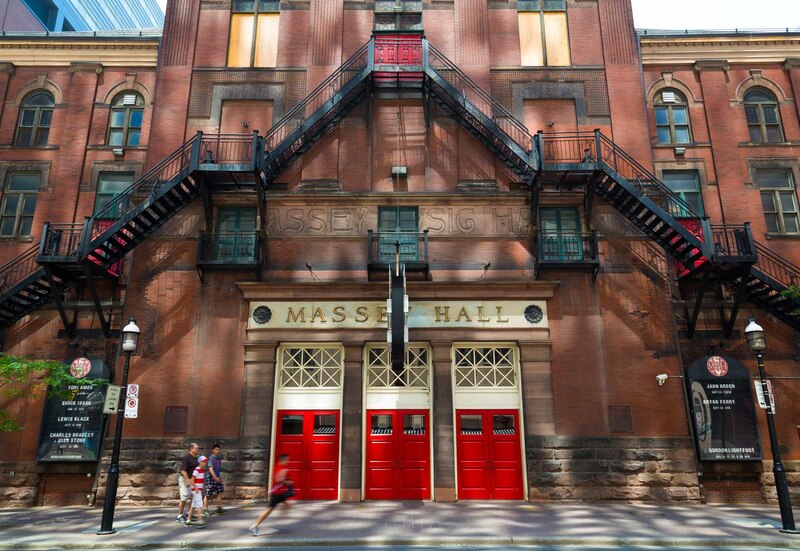 A new era began with Massey Music Hall (Massey Hall) opened in Toronto in 1894, built expressly for orchestral and massed choral performances and deliberately unsuited for theatrical fare, though it was used also for rallies and other assemblies. An example of private munificence, Massey Hall for many years remained unique among Canadian auditoriums, the envy of other centres because of its size, suitability, and acoustic properties. (Montreal had a hall built especially for concerts: Queen's Hall, 1880; but it was much smaller, became a theatre in 1891, and was destroyed by fire in 1899. The same city's Monument national, however, built 1891-4 and not intended primarily for concerts, became the site of many, and was still standing in 1990; restoration was in progress for its centennial in 1993 but the building was damaged by fire in 1991. Massey Hall unfortunately did not set a pattern. On the contrary, despite the prosperity of the opening years of the 20th century the construction of auditoriums languished. One exception was the Auditorium de Québec, opened in 1903, which later became the Capitol Theatre, a movie house. As old forms of entertainment, such as vaudeville, gave way to the movies, many theatres and opera houses that had been homes to orchestras and choirs were converted to movie houses - eg, the Orpheum in Vancouver, which, built as a vaudeville theatre in 1927, was transformed into a movie palace in the 1930s. (In what may be regarded as a step up the musical ladder, however, the Orpheum was transformed into a concert hall in 1977, as the new home of the Vancouver Symphony Orchestra.) The Royal Theatre (Victoria, BC), Victoria, built in 1913 in vaudeville style, was home to the Victoria Symphony Orchestra from 1943, even after the 1946 modernization turned it into a movie house. Renovations 1982-9 restored it for music and theatre performances. The Capitol Theatre in Nelson, BC, was built in 1927 and restored in 1988. The Winnipeg Walker Theatre, built in 1907 as one of the finest theatres in North America, flourished until the 1930s. After use as a movie house, it was being restored in early 1990s. In Ontario the Temple Theatre, Brantford, opened in 1919 and renamed the Capitol in 1929, was restored in 1989 as the core of the Sanderson Centre for the Performing Arts. The Pantages Theatre, Toronto, opened in 1920 and renamed the Imperial in 1930, was restored to its original name and beauty in 1989. The Elgin and Winter Garden Theatres, Toronto, opened in 1914, one above the other, primarily for vaudeville. The ground level Elgin became a movie house in the late 1920s and closed completely in 1981, and the Winter Garden was closed in 1927. Under the auspices of the Ontario Heritage Foundation, restoration of both theatres took place 1984-9. Other halls were torn down - eg, the Russell Theatre in Ottawa, which was demolished in 1928. The Grand Opera House (Toronto) in Toronto (the 1880 replacement of the 1874 building destroyed by fire) was demolished in 1927. The Capitol Theatre, Cornwall, Ont opened in 1928, was torn down in 1991. For some 50 years - from World War I until the 1960s - many, if not most, concert and opera performances in Canada were given in halls inadequate in seating capacity, stage dimensions, acoustical properties, and rehearsal facilities. Some orchestras performed in movie houses on Sundays when movies were not allowed to be shown (Ottawa Philharmonic Orchestra in the Capitol Theatre); the CSM (MSO) played in the high-school auditorium, Plateau Hall; and among other more improbable solutions to the problem were the Metropolitan Opera guest performances in those famous hockey arenas the Forum of Montreal and the Maple Leaf Gardens of Toronto, and a recital by Nelson Eddy in Osborne Stadium, Winnipeg. In smaller cities churches, community halls, movie theatres, and high-school auditoriums have been the mainstay of performances in the 20th century. The discouragement to orchestral and operatic performance caused by the lack of proper halls is one of the blots on Canada's musical history. Among the positive events were the opening of a splendid recital hall, Eaton Auditorium, in Toronto in 1931, and the construction of identical halls in Calgary and Edmonton, the Alberta Jubilee Auditoriums, opened in 1957. Others erected 1920-60 include Darke Hall auditorium, Regina (1929), the Winnipeg Auditorium (1932), the Queen Elizabeth Theatre, Vancouver (1959), and the O'Keefe Centre, Toronto (1960). One theatre of unique antecedents was La Poudrière, built in 1822 on St Helen's Island near Montreal to store gunpowder, which was converted into a theatre in 1957. The hall has been used for chamber music, recitals, and small scale opera productions. The relative prosperity of the 1960s and the wave of initiative and civic pride engendered by preparations for Canada's centenary in 1967 are the main reasons for the construction of many fine buildings across Canada. Many of these embodied a new concept: the performing-arts or cultural centre, a group of connected buildings designed as an architectural unit, with two or more halls, differing in size and varying in function from recital and lecture to concert, theatre, and opera. Such complexes often included museums, art galleries, libraries, planetariums, and restaurants. The most famous examples are Montreal's Place des Arts (opened 1963, 1967), Charlottetown's Confederation Centre of the Arts (1964), the Arts and Culture Centre in St John's, Nfld (1967), the Manitoba Centennial Concert Hall, Winnipeg (1968), the Saskatoon Centennial Auditorium (1968), Ottawa's National Arts Centre (1969), and the Grand Théâtre de Québec (1971). 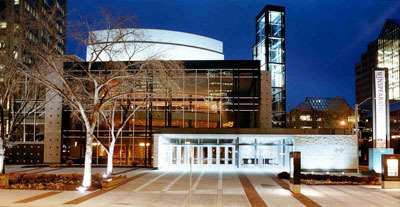 Other fine concert halls opened in the 1970s include the Saskatchewan Centre of the Arts in Regina (1970), the St Lawrence Centre in Toronto (1970), the concert hall in the Winnipeg Art Gallery (1971), the Rebecca Cohn Auditorium (Dalhousie University Arts Centre) (1971), and Hamilton Place (1973). New in the 1980s were Kitchener's Centre in the Square (1980), Toronto's Roy Thomson Hall (1982), the Calgary Centre for the Performing Arts (1985) (now EPCOR Centre for the Performing Arts), the Thunder Bay Community Auditorium (1985), Centrepointe Theatre, Nepean, Ont (1988, see Ottawa), and. Fort McMurray's Keyano Theatre, opened in 1990. In July 1989 an amphitheatre seeting 2000 indoors and 8000 outdoors was inaugurated in Joliette, Que (see Festival international de Lanaudière). Elsewhere as well, universities have built halls that are focal points for the musical life of their cities, eg, MacMillan Theatre and Walter Hall at the University of Toronto, Pollack Concert Hall and Redpath Hall at McGill University, Western Manitoba Centennial Auditorium at Brandon University, and the Concert Hall at the University of Victoria. Concordia University inaugurated a 600-seat hall in 1990, and in 1991 plans were under way to build a new hall at UQAM. Starting in 1979, the City of Montreal developed the concept of Maisons de la culture de Montréal. There were 13 in operation in 1991, the main one being the Chapelle historique du Bon-Pasteur which has a heavy schedule of musical events. In 1991 discussions were underway concerning the building of a ballet-opera house in Toronto and a new symphony concert hall in Montreal. Although the need for both halls was acknowledged by the musical community, their completion was not certain in the political and economic climate of that time. See also Centennial Hall (London, Ont); Concerts; Ermitage; Grand Theatre (Kingston); Hart House; Her (His) Majesty's Theatre; Orford Arts Centre; Malkin Bowl; Mechanics' Hall/Salle des artisans; Mechanics' Hall (Toronto); Montreal Arena; Music Gallery; Ontario Place Forum; Orchestras; Palais Montcalm; Rainbow Stage; RIDEAU; Royal Alexandra Theatre; St Denis Theatre; Sohmer Park; Théâtre de Société; Orpheum Theatre (Montreal), Theatre under the Stars; Tudor Hall; and Windsor Hall. EMC articles on individual cities should be consulted for references to concert halls and opera houses. Many universities have concert facilities. These are noted in the EMC articles on individual universities (see Universities directory). See also Boîtes à chansons; Canadian National Exhibition; Coffeehouses; Disco; George's Jazz Room; Le Patriote; Riverboat.